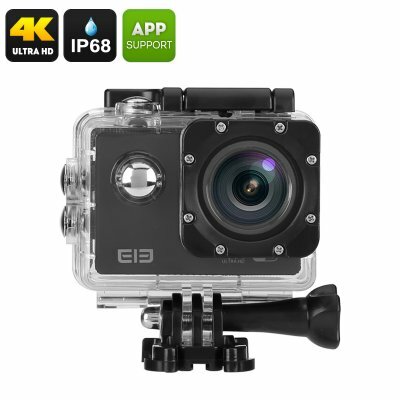 Successfully Added Elephone ELE Explorer 4K Action Camera - 16MP Sensor, 170 Degree View, 2 Inch Display, IP68 Case, Wi-Fi (Black) to your Shopping Cart. Looking for an action camera that's affordable and can still shoot 4K, enter the Elephone ELE Explorer. With an OV4689 16.0MP CMOS sensor, you can record video footage in spectacular detail. it has a 170-degree lens so you can fit more in each shot and with full HD captured at 60FPS its a great option for less than 50 bucks. With a loop recording mode that will create a new video file every 3, 5 or 10 minutes the ELE Explorer can even double as a dash cam. Having Wi-Fi capabilities means you can use the Ele-Cam app on your Smartphone (iOS / Android) and effortlessly transfer your pictures and video for sharing online. So you don't have to remember to pack extra cables with you. The Elephone app will let you change settings and even give you a lie feed to your phone so as you can use it as a remote control or to view the action as it unfolds. The rear of the camera has a respectable 2 inch LCD screen so lining up shots and replaying the action is a doddle. With a mini HDMI and USB out you can even replay the action on your TV or computer. This sports action camera comes with a multitude of mounts and accessories including those for a helmet, tripod, and handlebars. A waterproof housing protects the camera to depths of 30 meters so taking it on your underwater adventures won't be a problem. A micro SD card slot brings support for up to 64GB of storage while the removable 1050mAh battery will bring about 50 minutes of video recording in 1080P at 30 FPS before it will need recharging. The Elephone ELE Explorer 4K action camera comes with 12 months warranty, brought to you by the leader in electronic devices as well as wholesale sports and action cameras..
Not seen the product as it was delivered as a gift, but the service was amazing. Delivered DHL. Picked up in China, delivered to Hong Kong, through Brussels, into England, then sent up to the Highlands of Scotland all in 30 Hours.